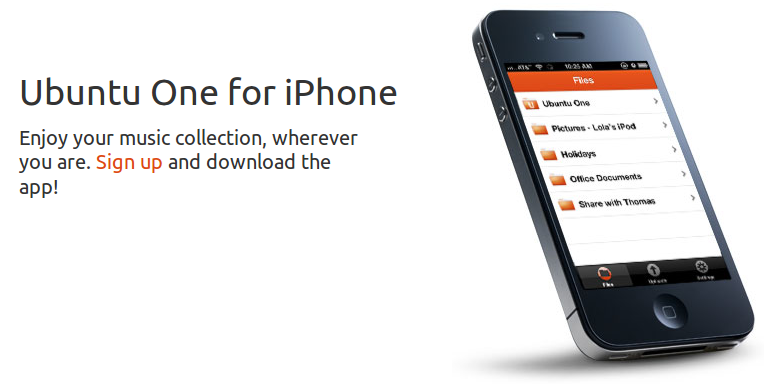 Ubuntu One Files is like the iCloud funtion on iOS devices, it will automatically send photos from the iOS device directly to one's Ubuntu One account (and other connected devices) every time the iOS' Files app is opened. Since 5 Jan 2012, Ubuntu One Files (Version 1) was landed in App Store and available for install, this version is compatible with iPhone, iPod touch, and iPad or that Requires iOS 4.0 or later. For now, not only Ubuntu user enjoy free 5GB of cloud storage from Ubuntu One but also iPhone/iPad user can enjoy it. Using Ubuntu One Files App, users can access and manage their files including music and photos which stored on Canonical's Ubuntu One cloud storage. The basic service of Ubuntu One is Free 5 GB storage, if you feel less or if your free services is out you can upgrade the service into 20 GB of storage with cost 3.99$ per month or 39.99$ per year (available 30 days trial). Download Ubuntu One File through following links, lets enjoy 5 GB free storage from canonical, the more you share the more you get.